This is Combination of my previous TDLs. So, Before using it turn off all previous Tdl. With this Add-on, you can display Item with GST Hsn code/ Rate in an invoice, Stock Summary and columner Report. It will act as a helper for the customer. It also helps you to make sure that the Item Hsn Code and GST Rate. This Add-on supports Credit Note, Debit Note, Sales, Purchase, Delivery Note, Purchase Order, Sales Order Receipt Note etc. · you can watch GST hsncode and gst Rate at the time of invoice entry. · you can watch/check/display GST hsncode and gst Rate on invoice after invoice entry. · You can Gst%/hsn code in columnar register also. 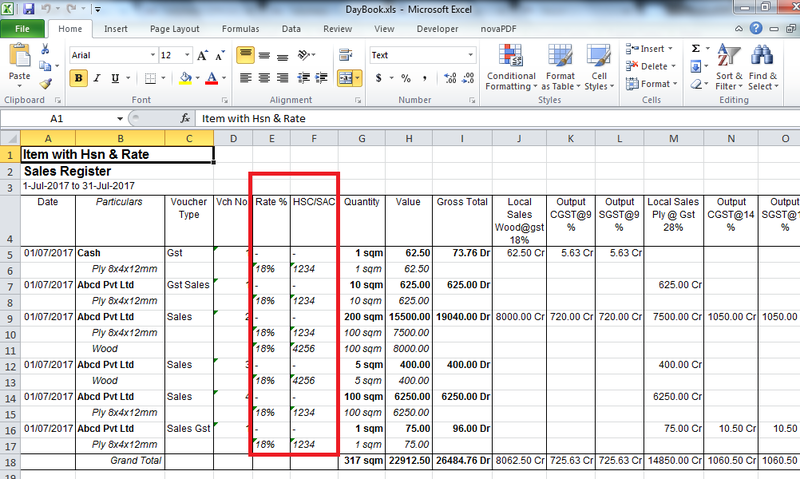 · You can export Gst%/hsn code form columnar register to excel/other format for creating reports. · You can check GST Rate/hsn code in stock item list table at the time of invoice entry and voucher entry. · You can check or calculate manually Gst% wise sales or Gst hsn code wise sales by exporting sales columnar register in excel also. 1. Download tdl file at the end of this post. hut down and Restart Tally.ERP 9 and open your company. 3. Get Add-on help and open user manual. Go to H: Help à Add-on Help to open the user manual. Press Ctrl + Alt + H to get Add-on help..
Not Working. Not been able to activate it now. Please upload fresh file. What is the cost of it ? TDL name is "item with GSt hsn&rate with columner.tcp"
Sir, Not Working. Not been able to activate it now. Please upload fresh file. tdl of item with gst and hsn code are not working so please give fresh tdl on my main id. "item with GSt hsn&rate with columner.tcp"
is mail pe bhaj dijye. Please renew this tdl or please provide life time working TDL. We have tried TDL,it is very useful to us,want to buy the TDL,Need to know the cost of TDL and whom to contact. I want to purchase this TDL. Please send me the details how to purchase it? My E-mail ID is tarsontraders@gmail.com. Please send it to my e mail sgenterp3@gmail.com.